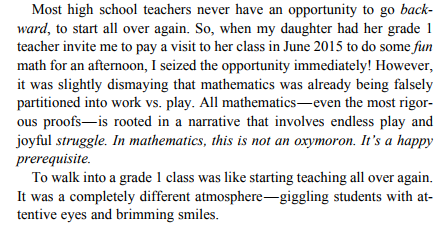 In June 2015, two years after I had quit teaching — I was a high school math/physics teacher for 20 years — Raya, my daughter, who was in Grade 1 at the time, asked if I could come to her math class. What happened on that day completely dislodged me from what I thought about mathematics and math education. Such an imprint was left — tattooed even — that it got a critical mention in my book, Pi of Life: The Hidden Happiness of Mathematics. However, the activity that I am about to describe was strangely omitted from the book — maybe because I plum forgot! I have shown this activity many times to elementary teachers and the nodding affirmation is that young children are hard-wired for rigor, play and resilience. Bottom line: They are born mathematicians. Before discussing perfect numbers, I did the Handshake Problem, but fleshed out triangle numbers in the process. They were already smitten with the magic of numbers possessing geometric shapes when I showed them that the sum of consecutive odd numbers(which are all L-shaped, except for 1). So, I was curious if even the youngest kids could marvel in and explore the idea of…a perfect number. 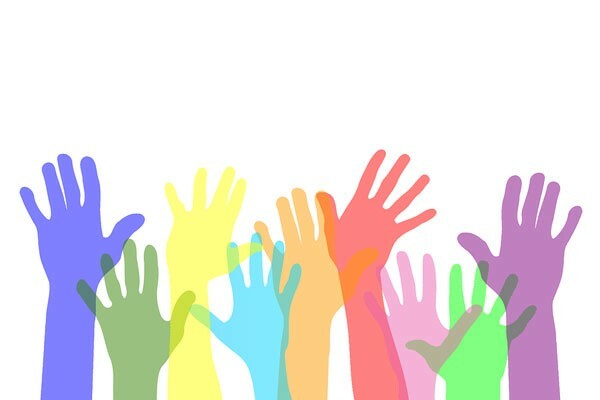 All 23 hands went up in the air. I grabbed my “testers”. I took the 1 cube and counted how many times it went into six — I ran the one cube along the length of the six cube. I made sure that the kids counted along with me. 1 works! I now tried the 2 cube, again sliding/hopping it through the length of six cubes. The kids counted out three. I tried the 3 cube. The kids counted out two. I picked up the 4 cube, and most kids said something like “it won’t fit”. There was no mention of division, factors or multiplying. But, that is exactly what kids were in the early stages of processing. I then took the successful testers of 1, 2, and 3 and built them to make a tower of 6 — the same height as the number we were testing. 6 is a perfect number. The magic of math was now in the room. 8(1, 2 and 4), 9(1 and 3) and 10(1, 2 and 5) fell short of the same height. 12(1, 2, 3, 4 and 6) was too tall. Are there any more perfect numbers? If so, what is the next one? I put a bags of blocks on each table(groups of 3 to 5 students) and asked them to find the next perfect number under 30…GO!! The kids began working feverishly building their towers(kids were only building even number towers after a while…). They also had to show their successful testers. After nearly 30 minutes, a group of 5 girls — who were jumping up and down like they were at a trampoline park — had found 28 was the next perfect number(1, 2, 4, 7, and 14). They also had their testers to prove it. I will say it for the nth time — kids don’t hate math because it is hard, they hate it because it is boring. I then asked if they were ready to find the next perfect number after 28. Many seemed up for the challenge. I told them we don’t have enough blocks — the next one is 496. Even before they finished their gasping, I wrote 8128 and 33550336 on the board. I turned around to see only bulging, white eyes. Not that this ice cream needed a cherry, but I threw one on top anyways. I told them that all perfect numbers are triangle numbers. Ostensibly, those kids got a math lesson. But really, it was me that learned the most. 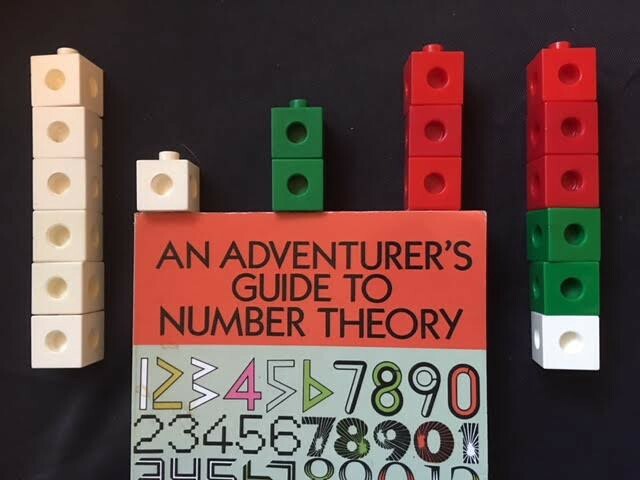 I took the most intrinsically and historically fascinating topic in mathematics — number theory — and saw children play, explore and be mesmerized by the beauty of mathematics. It galvanized my passion/goal to ensure mathematics moves in the direction that honors such joy, whimsy, and wonder. And love. Don’t forget love. Thank you Ms. Hagley’s Grade 1 class. Your enthusiasm and energy will never be forgotten.